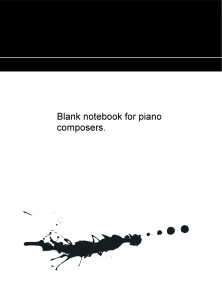 Cuaderno en blanco de 250 hojas de pentagramas para piano, para compositores de dicho instrumento. Con ambas claves para mano derecha e izquierda. Blank notebook 250 sheets of staves for piano, for composers of that instrument.With both keys to the right and left hand. Blank Notebook 250 Blatt Dauben für Klavier, für Komponisten von diesem Instrument. Mit den beiden Tasten rechts und links.